The fast-food CEO is uniquely unqualified to head the Department of Labor. 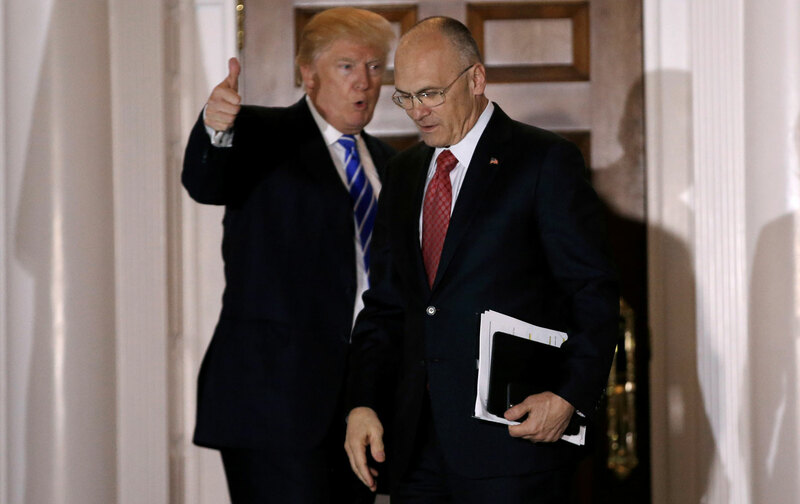 UPDATE: The Washington Post reported on Wednesday that six Republican senators are now on the fence on Puzder’s nomination. The senators it lists are Susan Collins (ME), Johnny Isakson (GA), Lisa Murkowski (AK), Tim Scott (SC), Rob Portman, (OH) and John Thune (SD). Call ﻿1-844-612-6113 to contact your senators today, especially if you live in one of those states. You can also watch and share this video produced by Allied Progress to sum up Puzder’s record. Puzder opposes meaningful minimum-wage increases, and attacked the expansion of paid-sick-day and overtime legislation. And while he rakes in millions as the CEO of CKE Restaurants, the parent company of Hardy’s and Carl’s Jr., workers struggle to get by. The company is currently being sued for wage theft and sexual harassment. This week was brutal, with both Betsy DeVos and Jeff Sessions approved to join the administration. But activists didn’t make the process easy, calling Congress in record numbers, holding rallies, and spreading the word about the danger Trump’s nominees pose. Now, as The Nation’s John Nichols points out, the “anti-labor secretary,” as critics are calling Puzder, has a real chance of getting rejected. Call your senators by dialing 1-844-612-6113 or finding their local office here. Demand that they reject Puzder’s nomination (we created a script to help you out) and then use the form below to let us know how it went. We also encourage you to join Fight for 15 this Monday, February 13, at rallies across the country to oppose Puzder. You can RSVP here. I am calling to urge you to oppose the nomination of Andrew Puzder as Labor Secretary. Mr. Puzder has shown again and again that he cannot be trusted to look out for workers’ best interests or to even follow basic labor laws himself. His company, CKE Restaurant, is currently being sued for wage theft and sexual harassment, and we recently discovered that he did not even follow labor laws when hiring a housekeeper in his own home. I urge you to oppose Andrew Puzder’s nomination.